An unsecured child-restraint system is dangerous. In a sudden stop or a collision it could move causing serious injury or death to the child or other occupants. Make sure the child-restraint system is properly secured in place according to the child-restraint system manufacturer's instructions. Attaching two child-restraint systems to the same LATCH lower anchor is dangerous. In a collision, one anchor may not be strong enough to hold two child-restraint system attachments, and it may break, causing serious injury or death. If you use the seat position for another child-restraint system when an outboard LATCH position is occupied, use the center seat belts instead, and the tether if tether-equipped. An unsecured child-restraint system is dangerous. In a sudden stop or a collision it could move causing serious injury or death to the child or other occupants. Follow the childrestraint system manufacturer's instructions on belt routing to secure the seat just as you would with a child in it so that nobody is tempted to put a child in an improperly secured seat later on. When not in use, remove it from the vehicle or fasten it with a seat belt, or latch it down to BOTH LATCH lower anchors for LATCH child-restraint systems. 1. First, adjust the front seat to allow clearance between the child-restraint system and the front seat. 4. Remove the head restraint. Refer to Head Restraints. 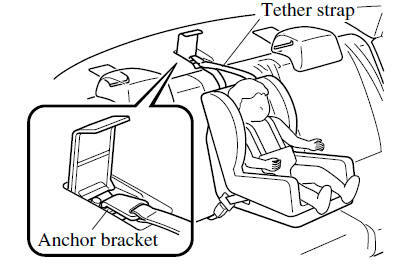 Using the tether or tether anchor to secure anything but a child-restraint system is dangerous. This could weaken or damage the tether or tether anchor and result in injury. Installing a child-restraint system without removing the head restraint is dangerous. The child-restraint system cannot be installed correctly which may result in death or injury to the child in a collision. Attaching the tether strap to the incorrect tether anchor position is dangerous. 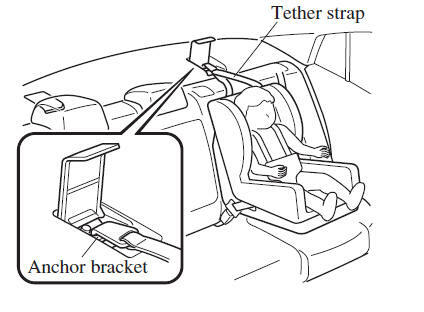 In a collision, the tether strap could come off and loosen the child-restraint system. If the childrestraint system moves it could result in death or injury to the child. Driving with the head restraint removed is dangerous as impact to the occupant's head cannot be prevented during emergency braking or in a collision, which could result in a serious accident, injury or death. Refer to Head Restraints. The LATCH lower anchors at the center of the rear seat are much further apart than the sets of LATCH lower anchors for child-restraint system installation at other seating positions. Child-restraint systems with rigid LATCH attachments cannot be installed on the center seating position. Some LATCH equipped childrestraint systems can be placed in the center position and will reach the nearest LATCH lower anchors which are 443 mm (17.4 in) apart. LATCH compatible childrestraint systems (with attachments on belt webbing) can be used at this seating position only if the child-restraint system manufacturer's instructions state that the child-restraint system can be installed to LATCH lower anchors that are 443 mm (17.4 in) apart. Do not attach two childrestraint systems to the same LATCH lower anchor. If your child-restraint system has a tether, it must also be used for your child's optimum safety. The procedure for installation on the rear outboard seats is the same. Driving with the head restraint removed is dangerous as impact to the occupant's head cannot be prevented during emergency braking or in a collision, which could result in a serious accident, injury or death.